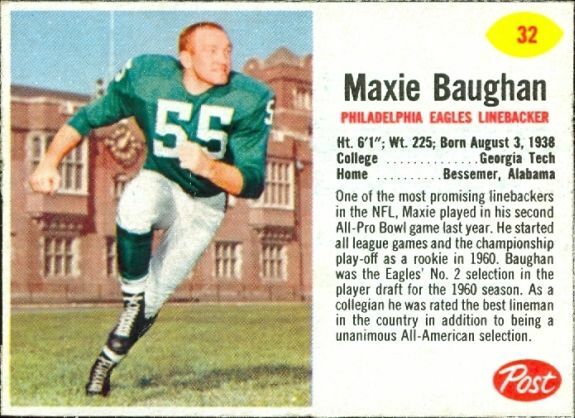 The adhesive that shows up on the backs of 1962 Post cereal football cards is a byproduct of the wax liner bag being affixed to the inside of the box. The common term for the adhesive is "wax," as it often resembles a paraffin-like substance. This is especially true for cards near the top of seven card boxes and Alpha-Bits ¾ oz. cards. Other boxes such as 12 oz. Grape Nuts Flakes and Top 3 10 oz. have the look of contact cement sprayed down each side of the inside back panel, fading in intensity from top to bottom. Oat Flakes 10 oz. boxes have adhesive in the top center and 8 oz. Post Toasties have the same mark plus adhesive down the sides a la GNF12 and Top 3. Knowledge of which cards have adhesive on the back can often help to identify the product from which the card came. 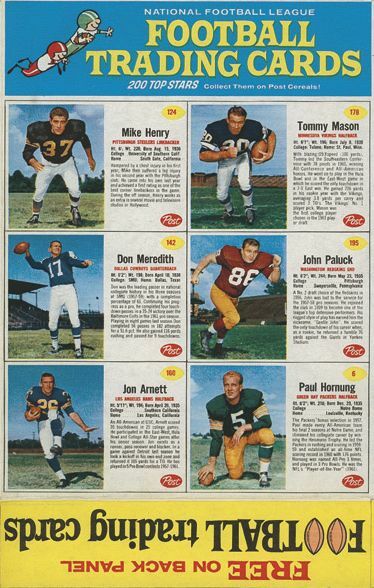 Norman Snead #198 has two cards—16 oz. Bran Flakes and Sugar Coated Corn Flakes 10 oz.—that are cropped nearly the same and the coloring on the cards, while different, can be difficult. The absolute sure way to tell is to look at the back for adhesive at the top. The SCCF10 has adhesive and the BF16 does not. So if you can get a back scan or the seller provides the information in the description or will answer your question, you're in business. Each product has an image of an inside back panel under the Cereal/Boxes tab to illustrate which cards on a panel will be affected by the adhesive. Whether adhesive is present or not is included in the information for each card in the Master Set card by card breakdown. This illustrates what can happen when ink runs low on Grape Nuts Flakes 12 oz. and Top 3 10 oz. cards. While there are general color consistencies that allow collectors to tell GNF12 and Top 3 cards apart, low ink can affect the appearance enough to confuse identification. 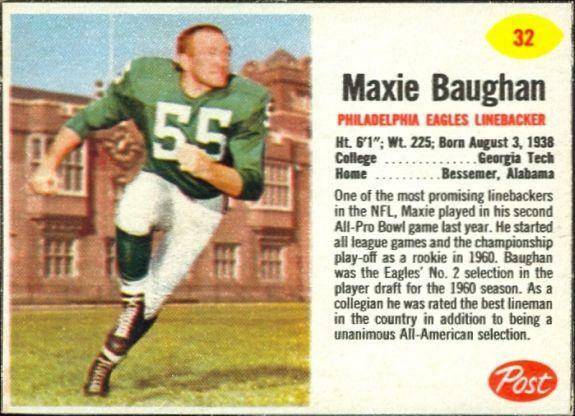 These cards of #32 Maxie Baughan are both from 14 oz. Sugar Crisp panels. The coloring is quite different. Both color variations are fairly common. Whether this is the result of two separate sets of rotogravure cylinders due to mechanical failure or is an ink intensity byproduct isn't known. There are other situations where two cards from the same product will have color variations. One possible reason is that the bottom flap on some box panels could be two different colors. Take a look at the same panel with two different bottom flaps. The colors are slightly different. Was it because of the bottom flap color or simply because of ink intensity differences when the ink wells were filled? There are several boxes that were printed with different colored bottom flaps. 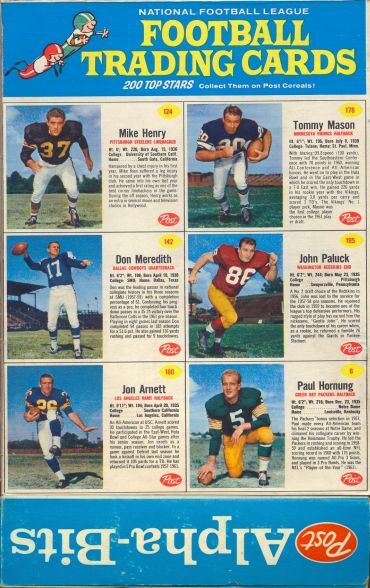 Collector and avid Post cereal researcher, Dave Worley, notes that boxes with advertising text "FREE on back panel FOOTBALL trading cards" were known as "shelf talkers." The term "shelf talker" was used by Post when referring to grocery store advertising pieces as well as the bottom flaps of certain cereal boxes. Boxes could be stacked and displayed in various ways on the shelf, including flat and on their sides as well as the normal face forward view generally seen. When stacked flat or on the side, the box would show the bottom flap featuring the shelf talker advertising. The chart below shows at least some of these boxes. There were at least two panels with different colored bottom flaps, the Alpha-Bits 8 oz. box pictured above and Sugar Crisp 9 oz. panel 37 had a box with the more common green panel and also a yellow shelf talker. * The only available Crispy Critters scan with a visible bottom box flap shows it to be red. If red was the standard bottom flap color for Crispy Critters that would be a break in pattern as all the other boxes that have the same color bottom flap as the predominant front color. The assumption shown in the chart is that yellow was the standard Crispy Critters bottom flap color and red would have been the variation color. 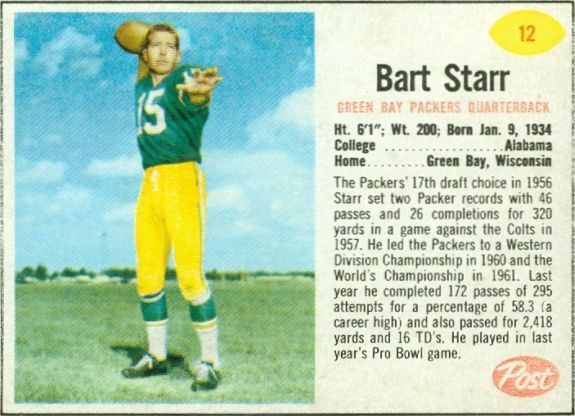 There are four products that were printed such that each of the cards shared a border with the card beside it. The Alpha-Bits 8 oz. panels shown above are examples of common border cards. Cutting these cards was difficult without cutting into the adjacent card. The products that featured common border panels were Alpha-Bits 8 oz., Crispy Critters 8 oz., Bran Flakes 11 oz. and Sugar Crisp 9 oz. There were six cards in the set that were printed only on common border panels. 68 John Morrow Alpha-Bits 8 oz. Crispy Critters 8 oz. 80 Dee Mackey Alpha-Bits 8 oz. Bran Flakes 11 oz. Crispy Critters 8 oz. 87 Bill Pellington Alpha-Bits 8 oz. Bran Flakes 11 oz. Crispy Critters 8 oz. 99 Jerry Mertens Bran Flakes 11 oz. Sugar Crisp 9 oz. 162 Zeke Bratkowski Bran Flakes 11 oz. Sugar Crisp 9 oz. 195 John Paluck Alpha-Bits 8 oz. Bran Flakes 11 oz. Crispy Critters 8 oz.